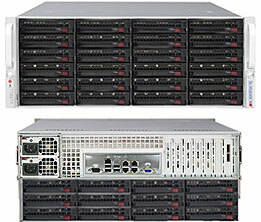 eRacks/NAS36 Upgraded, 216TB / 4U now available Under $30K! eRacks Open Source Systems announces the immediate availability of the eRacks/NAS36 rackmount storage server, with 36 removable 6TB hard drives, which yields a maximum of 216TB (Terabytes*) of raw storage with current widely-available technology. The eRacks/NAS36 rackmount server is shipped pre-configured to the user’s custom specs, with any available open-source software, and more flavors of Linux or BSD available than any other vendor. 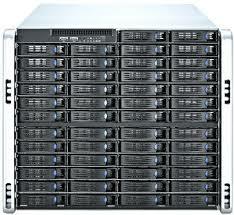 eRacks Open Source Systems is pleased to announce the latest upgrade eRacks/NAS36 rackmount storage server. Available immediately, it combines a rack usage of only 4U with a density of 36 drives (24 front and 12 rear), which, when combined with the current technology of widely available 6TB drives, yields a total storage of 216TB*. When populated with 36 removable drives in only 4U, this represents a density / price breakthrough – using the best value (lowest price/TB) 6TB drives, this enables 216TB* of raw storage in only 4U, and for less than $30,000, as configured on the eRacks website. Also available is OpenStack, and other OSS cloud software, such as Eucaluyptus or CloudStack, as well as best-of-breed Open Source software for BigData / Cloud storage, NAS, and networking – including Hadoop, MooseFS, CIFS, GlusterFS, etc – and eRacks is a partner with MooseFS.org. In addition, the eRacks policy is to install any Linux/BSD distro or Open Source software on request – Contact eRacks today at http://eracks.com/contact to see how they can meet your needs. Please email info@eracks.com to request a custom quote. Note: *For the purposes of this press release, the term “Terabyte” is used to mean one trillion bytes – eRacks understands the issues about this, we are using the term as the disk drive and other industry manufacturers use it.